Office Supplies Talk: What? An Erasable Highlighter? How many times has this happened to you gentlemen? As you are reading another Press Release from the Head of the Public Relations department you highlight a word because a common misspelling creates a hilarious double entendre. As you are walking down the hallway to show it to the guy in Sales who plays on your Softball team you read it again and notice that his misspelling was actually just your misreading. You don't want to be caught walking around with a Press Release with a random word highlighted and you need to get rid of the evidence fast. Shredding the paper will take to long since the big shredder is on the second floor. 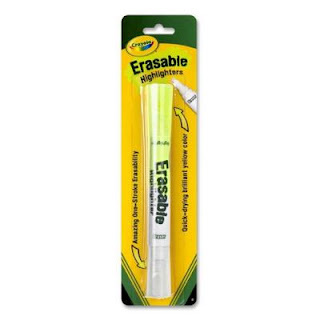 Wouldn't it be great if you had an Erasable Highlighter? Now I don't actually expect the previous example to reflect your life (I know I don't play Softball), but there are lots of reasons you might want to erase some highlighter. Prior to Pilot's line of FriXion pens and markers your options for erasing ink or any kind was extremely limited and usually meant you ended up thinning your paper. Once your paper was thinned out you might be able to erase once more on that same spot before the paper just started to tear. This new line of FriXion (yes, with a capital "X") changes all that because the ink is thermo-sensitive. I was shocked to discover that thermo-sensitive, or thermosensitive, wasn't just a word that Pilot made up, but scientists actually decided that they needed a word that meant temperature sensitive but was four letters shorter. Thermo-sensitive inks are created so that when they are heated (usually by friction) they chemically change so that yellow highlighter you previously applied to the paper is now clear. I'm not a chemist, so I can't understand or go into details, but I'll just let you know that they work, and they work well. Every FriXion pen or marker comes with a little rubber nub on the back side that you can use to easily create some friction on the paper without tearing up the paper fibers. I would expect most people to want to buy 12 yellow highlighters, but it is possible that you'd only want 2 yellow highlighter, or maybe 3 multi colored highlighters (pink, yellow, and orange). Don't think Pilot is the only people with a team of chemistry wizards on staff who can make an erasable highlighter. 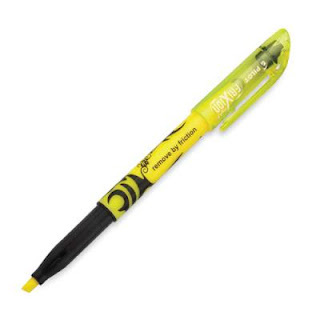 Those guys over at Crayola came up with their own variety that chemically changes your yellow highlighted ink to a clear ink when another solution is applied from the opposite end of the highlighter. I think that means the Crayola highlighter ink is chemosensitive rather than thermosensitive. The scientific shortening of chemosensitive also saves 4 letters from chemical sensitive, and just like thermosensitive it is a legit word that spell checking hates. While these chemosensitive highlighters are only available in one wonderful shade of yellow, you can buy one on a card, or 12 in a box and of course you'll save money when you buy a dozen instead of buying them individually.